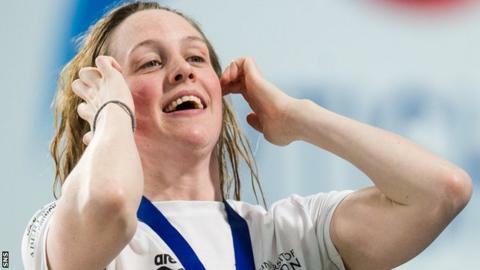 Hannah Miley hailed her performance as "amazing" despite finishing third in the 400m individual medley at the British Championships in Glasgow. Compatriot Ross Murdoch also took bronze as the Scots both missed out on the chance to qualify for this summer's World Championships. But Miley is still recovering from ankle surgery in December. "I'm not trying to aim for the worlds, because I know that's one step too far for me this time," she said. "I'm not in peak condition and I just want to progress each time I race and keep moving it that little bit forward and hopefully I'll be pain free by the end of the year." Only the winner of each race is guaranteed a place in the British team heading for Gwangju, South Korea, in July. Aimee Willmott's victory in four minutes 36.98 seconds should be enough for the Commonwealth champion to qualify. Abbey Wood finished second ahead of European bronze medallist Miley, who failed to make the World Championships qualifying time. "I have only been able to kick and do proper training sessions since the end of January and even still I've had to build it up," Miley said. "So to go 4:42 considering the six months I've had, that's amazing and to come away with a medal, especially at my age, I'm really chuffed with that." Murdoch was edged out of the second qualifying spot by James Wilby as Adam Peaty stormed to victory in the 100m breaststroke. However, the Scot said: "That's the fastest I've ever been at this time of the season." Murdoch has another shot at qualification on Friday in the 200m breaststroke and, asked about his chances, replied: "We'll have to wait and see."